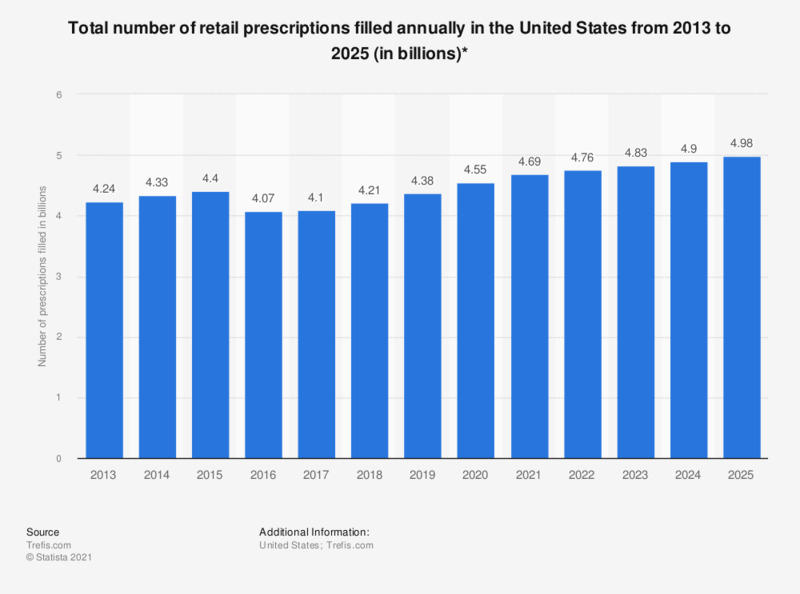 This statistic depicts the total number of retail prescriptions filled annually in the United States from 2013 to 2024. It is estimated that in 2019, 4.25 billion retail prescriptions will be filled throughout the United States. The retail drug industry is comprised of pharmacies or drugstores, as they are known in North America. According to Statista estimates, which were calculated based on numbers presented by IBIS World, pharmacies and drugstores in the United States will generate a revenue of 257 billion U.S. dollars in 2014. With an aging population and greater prevalence of chronic diseases, the need for safe, legal pharmaceutical drugs is constantly rising. Pharmacies and drug stores dispense prescription medications and over-the-counter drugs directly to patients. However, their role is more than one of simple distribution as they dispense medication in specific doses, adhere to optimal conditions of storage and give valuable advice to patients. Pharmacies practice in a wide range of locations such as communities, hospitals, clinics and nursing homes. Other drug retail outlets include supermarkets, and independent and online pharmacies, which offer mail-order drugs to patients, proving especially convenient for those that may be unable to leave their homes. In 2016, CVS Health was the leading drug store chain in the United States, based on retail prescription sales, generating approximately 60.8 billion U.S. dollars. Apart from selling drugs, miscellaneous products also account for a percentage of sales for these retail outlets, such as cosmetics and confectioneries. The retail drug store industry employs many different types of workers. Each store has a manager, along with department managers or assistant managers to handle additional administrative duties. Sales associates are generally entry-level retail workers. Pharmacists require a specialized degree and licensing to dispense medication.